1. Simmer the vinegar, bay leaf and peppercorns until reduced to 1½ T then strain. 2. Place the egg yolks in a heatproof bowl and whisk in the vinegar. 3. Set the bowl over a pan of gently simmering water (the bottom of the bowl shouldn’t touch the water) and whisk in the butter a little at a time until all the butter has been added and the sauce is thick (a stick blender or electric hand whisk make this an easier task - see ‘shortcut’). Season with salt, white pepper and lemon juice to taste. 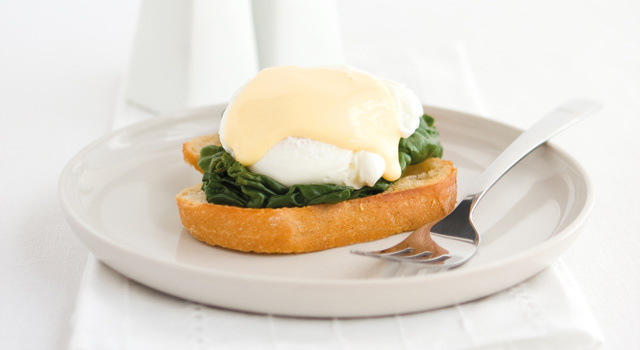 If the sauce begins to curdle, whisk in an ice block – if all else fails, start with a new egg yolk and add the split hollandaise gradually. Make sure the water in the saucepan is barely simmering – too hot and it will curdle your sauce. Thin the sauce with a little warm water. If not serving immediately, cover the surface of the sauce with cling wrap and place in a warm place or over a bowl of warm water for not more than an hour or two. Make a béarnaise sauce for steak: add 3T chopped fresh tarragon and 4 finely chopped shallots to the vinegar and simmer until reduced. Place the egg yolks and vinegar reduction in a blender and blend until combined. Gradually add the hot butter in a steady stream with the motor running until thick and glossy.